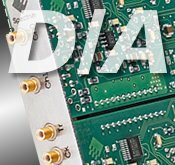 All Spectrum arbitrary waveform generators are available as multi channel waveform generators with up to 4 channels per card. The multi channel AWG's can be internally synchronized with the star-hub allowing to build systems with up to 64 synchronous channels. Single stand-alone units of the generatorNETBOX series are available starting with two channels and range up to 24 channels in a single Ethernet/LXI device. These multi channel waveform generators are often used in physics experiments and are well suited for Quantum research. The main advantage of Spectrum multi channel waveform generators against other vendor products is the feature of the internal synchronization. This allows to have a huge number of synchronous arbitrary waveform channels.